RIDLEY SCOTT'S 'PROMETHEUS' Is Set for Presentation At COMIC CON 2011! But what the hell does it mean? 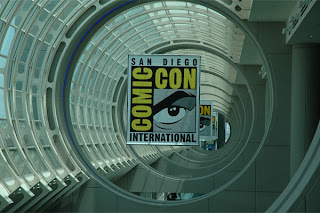 Well traditionally Hall H features major movie studios giving presentations that showcase favorite and upcoming feature films during the convention. There will be a panel discussion which usually features the director, producer and some cast members. Possibly even a prop or two [Terminator Salvation springs to mind.] The complete Programming for Comic Con schedule will be published about ten days to two weeks prior to the show. Comic Con runs July 21st-24th in San Diego. Interestingly most of the major studios: Warner Bros, DreamWorks, Disney & The Weinstein Company will be no-shows at Comic Con this year. So who will be there? Well Marvel "are on the fence" but there is expected to be some promotional content for The Amazing Spider-Man, other studio titles include Cowboys & Aliens, The Adventures of Tintin: The Secret of the Unicorn, The Twilight Saga: Breaking Dawn — Part 1, Shark Night 3D, Immortals and The Raven are all expected to have a presence. The news came via THR tweet @Bory_Kit, via AlienPrequelNews. "Ridley Scott's Prometheus movie will get a Hall H presentation at CC. As will Abe Lincoln: Vampire Hunter. But which actors will be there?" I do not know Squire but I hope I am. I'm reading: RIDLEY SCOTT'S 'PROMETHEUS' Is Set for Presentation At COMIC CON 2011!Tweet this!